I’m still craving warm rays of sun that peaches sweetly suggest. 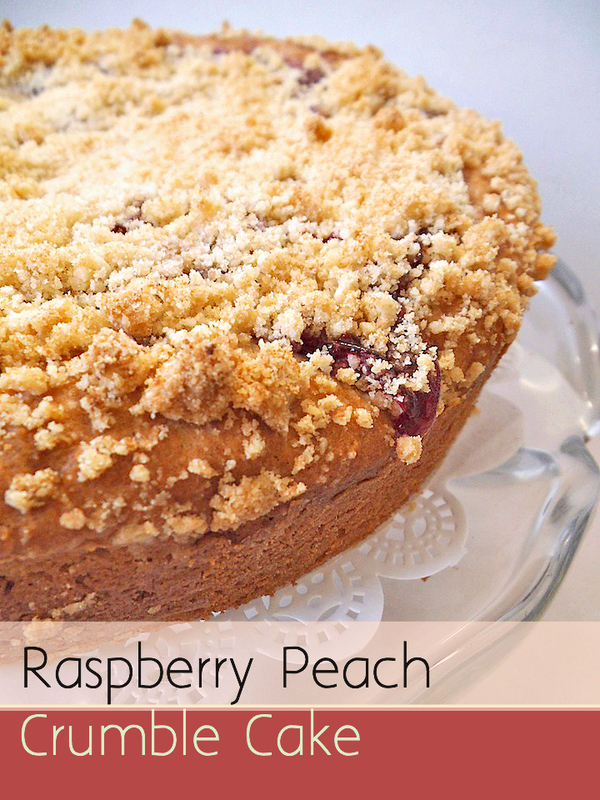 A crumble cake with peaches on top just had to happen, with red raspberries for tartness and added colour. Never mind that our early spring weather has been cool and blustery, with another chance of flurries still to come. We will taste sunshine, served on a plate, as we continue to celebrate the hope of new life. My three older children have been off from school since Good Friday, and my eldest daughter has been itching to bake something. Crumble cakes are one of her favourite desserts. I made the fruit filling, but otherwise the cake you see here was mostly done by her, with just a bit of instruction here and there from me. While I chopped sweet potatoes for supper, she was busy finishing the cake. When the cake was done and it had cooled somewhat, we pulled it out of the cake pan together (with four hands) to keep it intact. Thankfully, with the help of baking parchment, we were able to extract a nice round crumble cake, even without the benefit of a springform pan. Onto the cake stand it went, before eager smiles met each tender slice. We’ve still got a few slices worth of sweet crumble cake left today. Won’t you pull up a chair and join us? To make the fruit filling, stir together peaches with cornstarch or tapioca starch. Add honey, maple syrup, and lemon juice and heat in a medium saucepan over medium-low heat, stirring frequently, until starch dissolves. Add raspberries and continue to cook and stir gently until the filling thickens. Remove from heat and set aside to cool. Preheat the oven to 350 degrees F (180 C). Combine flours, butter or coconut oil, and sugar with a fork or pastry blender until fine crumbs form throughout. 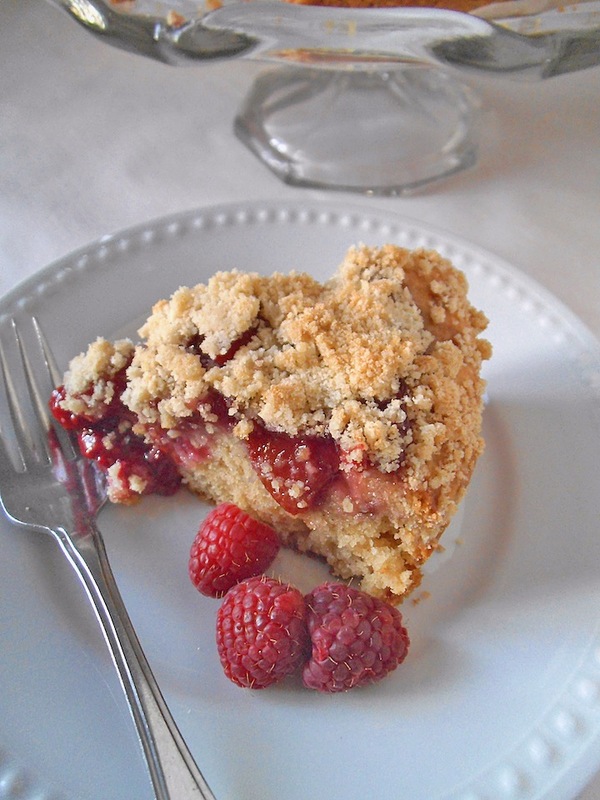 Take a generous 1/2 cup of this crumb mixture and set aside for the topping later. Add vinegar to the milk and then whisk in the vanilla and almond extracts. Let stand for 5 minutes before beating in the egg. Add the dry ingredient mixture (except for the reserved crumb topping) to the wet mixture, and stir until evenly combined. Into a greased 9-inch (23cm) cake pan lined with baking parchment or a greased round springform pan, pour the batter. Smooth out the batter with a rubber spatula. Add the raspberry peach filling, spreading to form an even layer, keeping the fruit filling about 2 cm away from the sides of the pan. Sprinkle the filling layer with the reserved crumb topping. Bake for 45 minutes or until middle tests done, being careful not to over bake. Let cake cool for at least 1 hour before slicing and serving. I’m bringing this cake to Fiesta Friday this week. I also share recipes here. This cake is just the thing to try to coax spring for sure! Yum! Thanks, Lili! I am happy to share! Lovely! I do like raspberries, and crumble! Excellent! Thanks! And it doubles as breakfast! Oh my heavens! What a beautiful cake! What a luscious combination of fruit. Raspberries and peaches are two of my favorite summer fruits. Pinned this for fruit season. This cake looks delicious, your daughter did an amazing job! Thanks for sharing at What’d You Do This Weekend? I hope you will join us again this Monday morning! This looks wonderful! 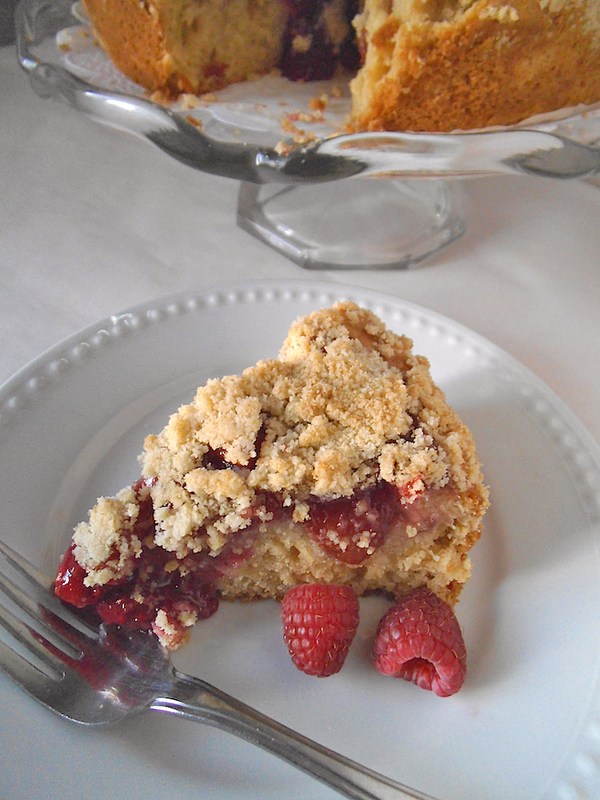 I love fruit on cakes and the crumble is always a plus. Hi there! Visiting from the Monday Funday link party. This looks super yummy! Thanks for sharing your recipe! Thanks for sharing your recipe at the Inspiration Spotlight party! Hope to see you again soon. Pinned & shared.